As much as the return of these ChineseBites dinners and assorted other food adventures have been good, there is a certain level of anticipation for the "large Chinese restaurant multi-course meals". Why? Well, other than special occasions, it isn't often that I go for a Chinese meal that includes all of the usual proteins and a good amount of seafood. 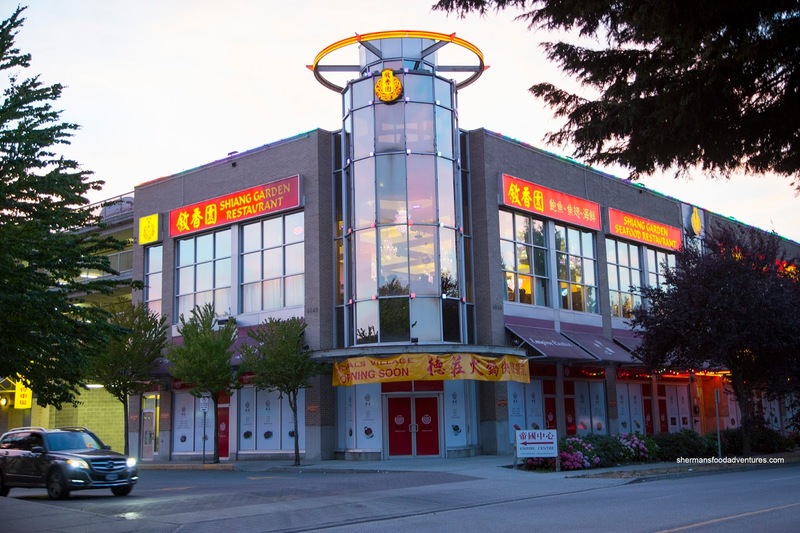 So the most recent ChineseBites extravaganza occurred at Shiang Garden where I enjoyed the company of Sean, Grace, Rick, Diana, Kirsty and Nancy. 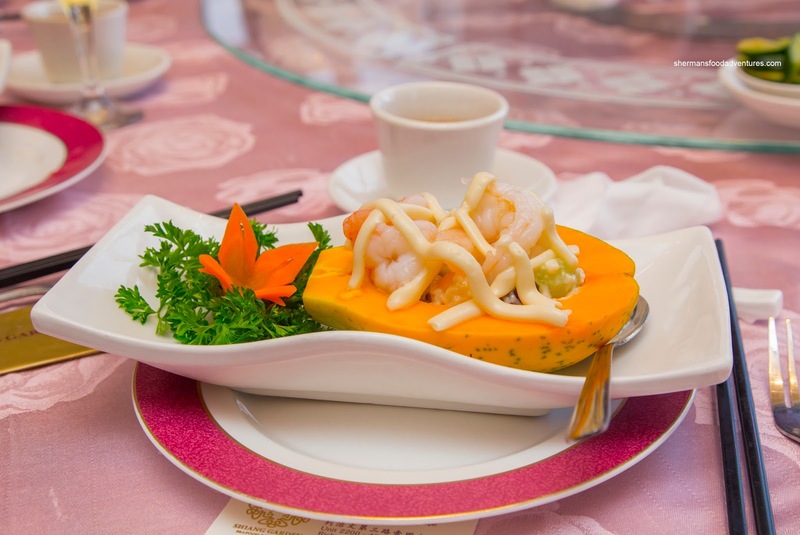 Things got started with Prawn Salad with melon and sweet mayo served in a half papaya. The 2 large butterflied cold-water prawns exhibited a classic crunch and snap that was accented by just enough mayo. Normally, I hate mayo with prawns and fruit, but this one wasn't too bad. Also, I'm not a huge fan of papaya, but for some reason, the ripeness was appealing. Next up was Sauteed Mixed Seafood consisting of large scallops, prawns and sea cucumber innards. Completing the dish was snow peas, flowering chives and a garnish of sliced cucumber and orange. I felt the seafood was cooked nicely where the scallops were buttery while the prawns ate with a snap. As much as the sea cucumber innards were just barely done, they were a touch chewier than usual. The whole dish was lightly seasoned with a starch-thickened glaze. 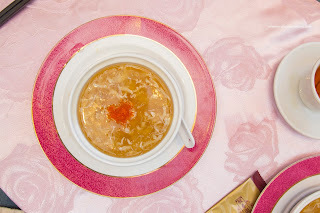 From there, we moved onto the Tremella with Chicken & Crab Meat Soup. 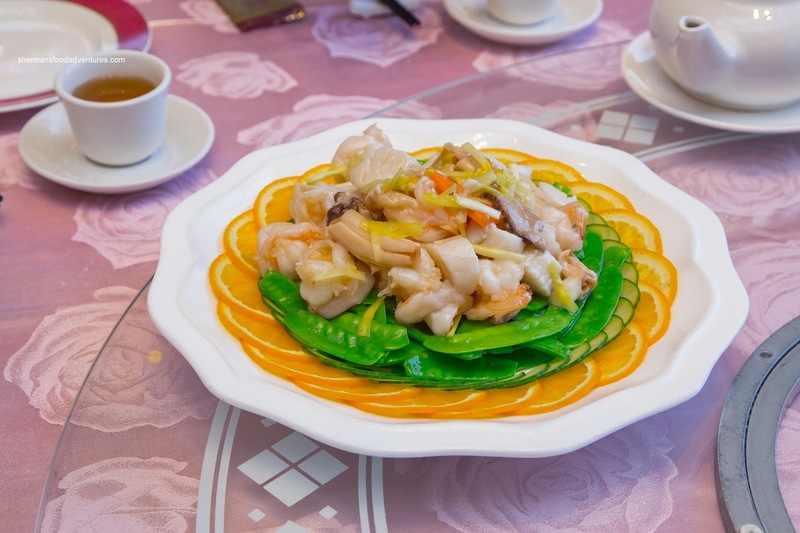 For those unfamiliar, tremella is a white fungus that has similar qualities as wood ear mushrooms except with a lighter crunch and with little-to-no flavour. Rather than using something like shark's fin or bird's nest, they were able to create a soup that possessed the same qualities (as in texture). The soup base was powerful with big hits of sweetness and salt. I found the thickness to be just right being silky while still "soupy". Next, we were presented with the Diced Beef Tenderloin with Honey & Pepper. 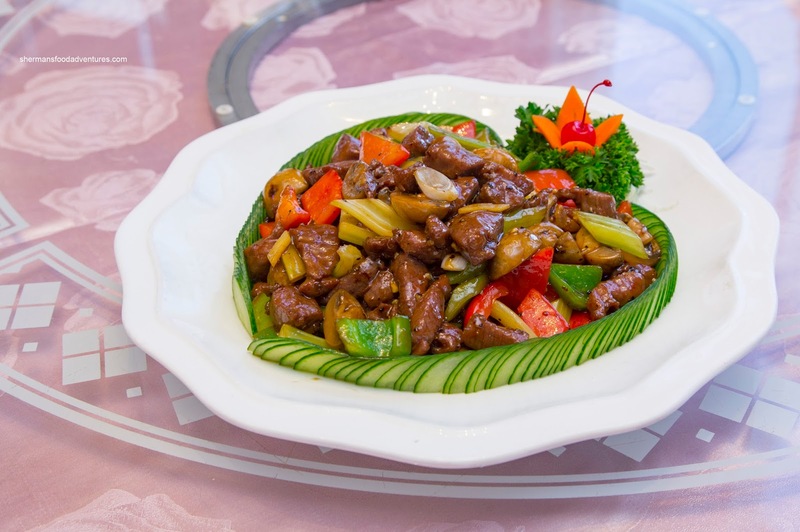 Framed by a heart-shaped sliced cucumber garnish, the stir fry was flavourful. It had nice complimentary flavours from the sweet honey and the pepper. However, the beef itself was over-tenderized where it no longer had a meaty texture. With our meat dish interlude out-of-the-way, we proceeded back to the seafood highway with the Steamed Spot Prawns with Garlic. 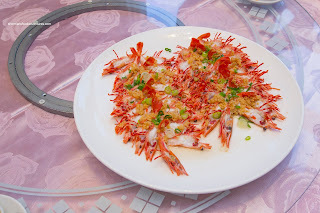 I loved the presentation as the split-down-the-middle prawns were effectively seasoned by the minced garlic and scallions. However, this method resulted in meat that lost some of its trademark texture. On the other hand, the meat was sweet and unmistakeably spot prawn. Our next item was the Lobster with Salted Egg Yolk. Normally, this dish can go one of 2 ways - either it can be aromatic and flavourful or wet and sloppy. Thankfully this one was the former as the significant amount of salted egg yolk was cooked until nearly dry (while at the same time retaining some moisture). This resulted in rich saltiness that went well with the sweet lobster. 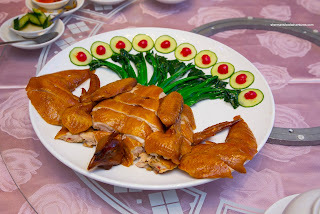 Back to another intermission, we had the Whole Chicken with Abalone Sauce. Looking very much like a soy chicken, this ate almost as such but with the aid of a side of abalone sauce. I decided to try both the white and dark meat to see if they were able to keep the whole chicken moist. That they did. Although the meat itself was lacking in inherent seasoning, one dunk into the sauce and there was enough saltiness and brininess to taste. 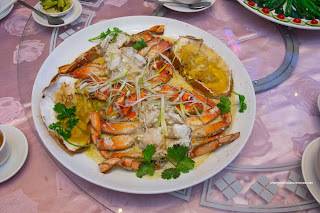 Yes and back to the seafood, we tackled the BC Dungeness Crab with White Wine Sauce. Steaming crab can seem simple, but there is no way of hiding any mistakes with this cooking process. 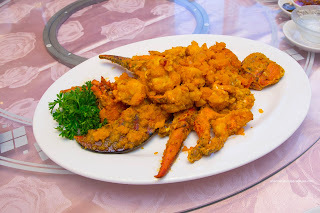 Well, they nailed it with fluffy crab flavoured with just enough wine to add a finish from the initial salty-sweetness. From here, we went back to the red meat with Lamb Chop with Honey & Pepper. This dish looked impressive, yet we could've done without the nearly raw onion garnish. 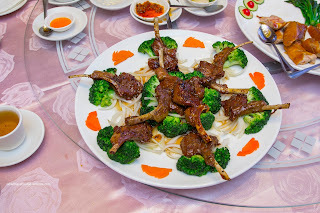 As for the lamb chops, they were meaty and super tender. Possibly too tender as they exhibited the same texture as the beef tenderloin. We would've liked to see more of a natural meatiness to go with the beautiful sweet and peppery glaze. Since a picture of a large piece of braised pork belly (Dong Bao Yuk) might not look impressive, I took a cut into it. While doing so, I noticed it was somewhat difficult to do, partly because of the blunt knife and partially since the meat portion of the belly was meaty rather than melt-in-my-mouth tender. Whatever the case, it was still sinfully buttery while lightly seasoned by the silky sweet sauce. 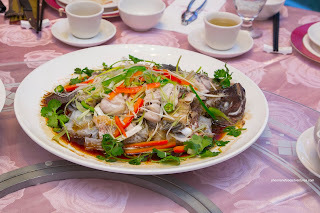 One last seafood offering was the En-Ping Style Whole Tilapia. Deboned into bite sized portions, the fish was soft and somewhat flaky (as tilapia tends to be on the mushier side naturally). With a bevy of scallions, peppers, green chilis and cilantro, there was enough complimentary flavours that added to the mild-tasting fish. In addition, the sweet soy added the necessary saltiness. 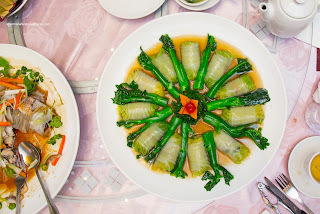 Our one vegetarian item was the Buddha's Feast Cabbage Roll. 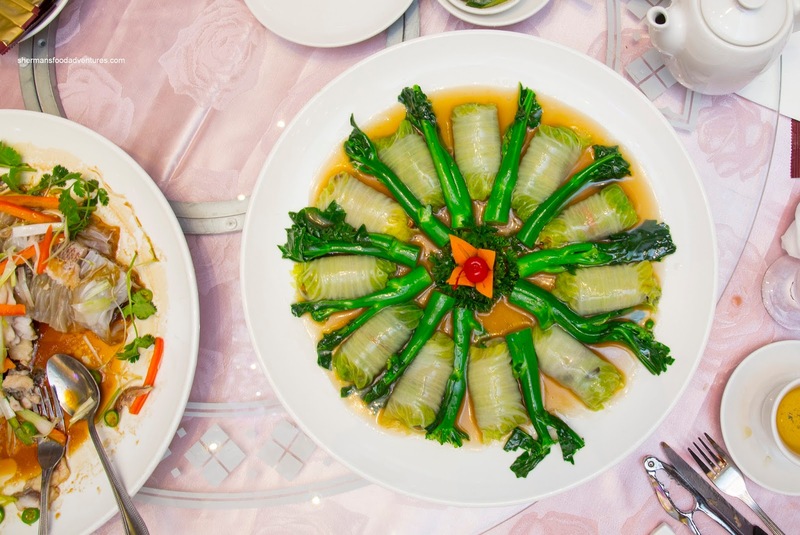 Carefully plated, the cabbage rolls were filled with carrots, wood ear mushrooms and enoki. It was not subjected to over-cooking which kept the veggies crisp and vibrant. Flavours were rather mild due to these ingredients, but it was a nice break from all the meat dishes we had. For dessert, we were served 2 items including the Baked Durian Pastry and Osmanthus Flower Cake Pudding. For many, durian is both smelly and unappealing. I personally don't mind it and actually enjoy the pungent sweetness. This was exemplified with the flaky and buttery pastry filled with a good amount of sweet durian. 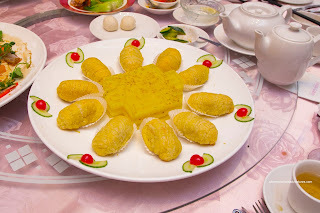 As for the flower cake pudding, it was a light gelatin with an equally light taste. It was not sugary at all with a floral essence. This was a low-key finish to a feast that had its fair share of seafood. Overall, all of the proteins were properly executed in terms of the cooking process. 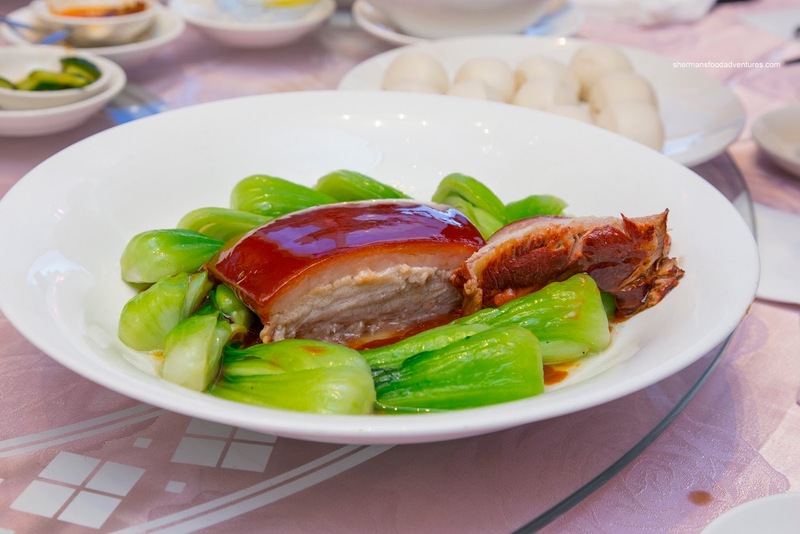 There was some over-tenderization of the red meats though, but that is pretty common for Cantonese cuisine.